A catastrophic explosion on board INS Sindhurakshak shortly after midnight on August 14, 2013 while docked at Mumbai harbor resulting in its sinking and death of 18 crew members and a fire on INS Sindhuratna on February 26, 2014 resulting in the death of two crew members has spurred the Navy to be better prepared for submarine accidents. The Indian Navy has so far relied heavily on the professionalism of its carefully screened submariners to preclude submarine related accidents; it has remained ill prepared to handle accidents like the sinking of a submarine in high seas. The Sindhurakshak tragedy seems to have hit home and jolted the the Naval leadership into accepting that submarines do sink. And they don't just sink on high seas, they can even sink in harbor! On April 30, 2014, through a RFI the Navy initiated procurement and installation of a 5-m Escape Training Tower (ETT) at Visakhapatnam in its quest to develop a state-of-the art submarine escape training facility at its premium submarine base. The service want an ETT built around the SEIE Mk 11 escape suit. In the case of a mishap resulting in the sinking of a submarine, the foremost priority of crew members is survival. Next, comes the need to escape. This should preferably by done using a submarine rescue vehicle which connects directly to the escape hatch of a submarine allowing crew members to be brought up to safety without exposing them to the high pressure at oceanic depths and possibly very cold temperatures. In case no rescue vehicle is available, as a last resort submariners can escape a stricken sub by wearing protective gear like the Submarine Escape Immersion Equipment (SEIE) MK-11 and bubble up to the surface. To facilitate escape, the escape tower or chamber of a submarine is designed to allow a submariner in protective gear to enter and flood it while inside. The submariner then opens the escape hatch and floats up to the surface. The process is repeated one at at time, allowing eight or more crewmen to escape per hour. This is referred to as Tower Escape. When escaping from depths greater than 100-m using tower escape, there is a significant risk of decompression sickness. A re-compression facility must be available. The RFI projects the requirement of a one/two man pressurization chamber for tower escape facility. In addition, the ETT should facilitate Rush Escape which is resorted to when either the single man pressurization chamber is not available for escape or the submarine hull is breached and the internal compartment is exposed to rapid flooding and raised ambient pressure. Flooding causes compression of the air within the rescue compartment, to an extent where air pressure matches the water column pressure at the ocean depth. When resorting to Rush Escape, submariners don their protective gear and open the escape hatch and one by one pass through the tower to the surface. Rush escape is perilous because bulky escape suits can make it difficult for crew to pass through the escape hatch; darkness and danger can result in crew mistakes and trigger panic. Submarine Escape Immersion Equipment (SEIE) MK-11 is whole-body suit and one-man life raft that allows submariners to escape from a sunken submarine at depths down to 600-ft at a rate of eight or more men per hour. 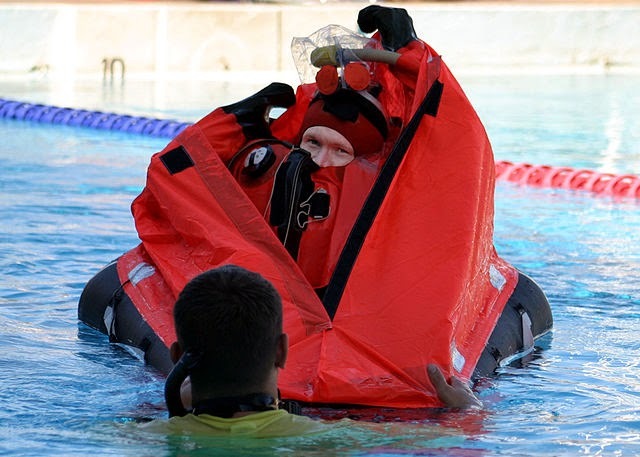 Developed by British company RFD Beaufort Limited, the SEIE typically comprises a submarine escape and immersion suit, an inner thermal liner, and a gas-inflated single-seat life raft, all contained in an outer protective stowage compartment. The equipment's buoyancy facilitates free ascent from a stricken submarine at a "safe" speed of approximately two to three meters per second. The inner thermal liner protects escapees from hypothermia. At the surface, the SEIE provides shelter and visibility. The SEIE provides a last resort escape option. In the case of a mishap, foremost priority for the crew is survival. Next, may come the need to escape. This should preferably by resorted to using a submarine rescue vehicle. A rescue vehicle connects directly to the escape hatch of a submarine protecting the crew.